Despite the sleep deprivation and never-ending to do list, I’ve been going full steam ahead with my goals of encouraging my students to think divergently and to pass the reigns of their learning over to them. I’ve presented at the GAFE Summit about how to use Google Apps to track this type of student driven learning. I’ve automated my classroom using Google Forms, docAppender and formMule to provide fast, efficient feedback to students. 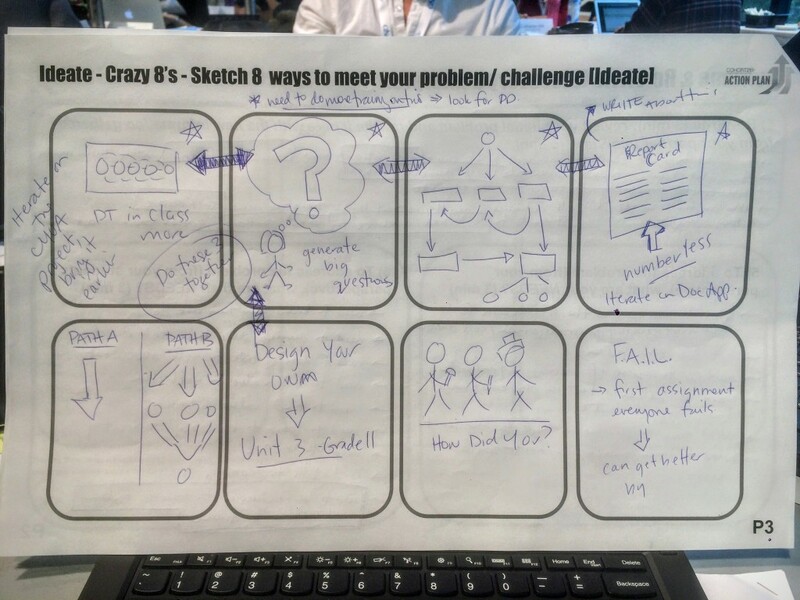 I’ve been using Design Thinking protocols to solve problems for almost a decade. 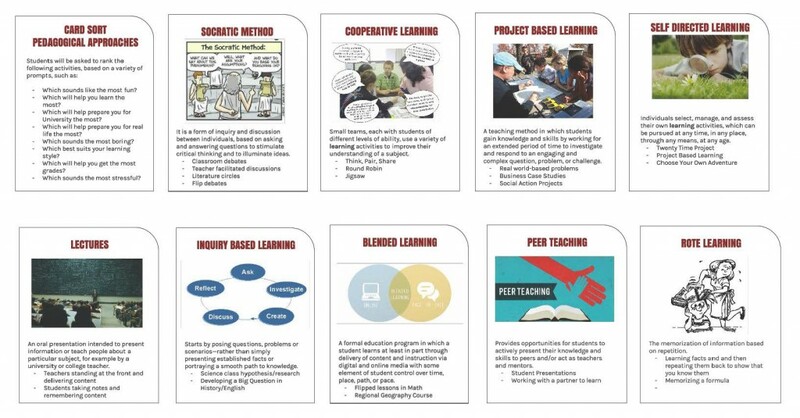 And, after five years of running project-based learning in my classroom, I have a lot of structures in place to manage student-driven learning. I’m ready to go, right? There is one key piece of this puzzle that I have missed: student motivation and readiness. As a facilitator, I have pumped “Empathize, empathize, empathize! !”…and yet empathize I have not. Instead, I have been assuming that my students need this type of learning experience, which means they must want to be self-directed and they are ready to take the reigns. So, inspired by @jenbibby’s Genius Hour action plan, I jumped right in with my Grade 11 Adviser class. 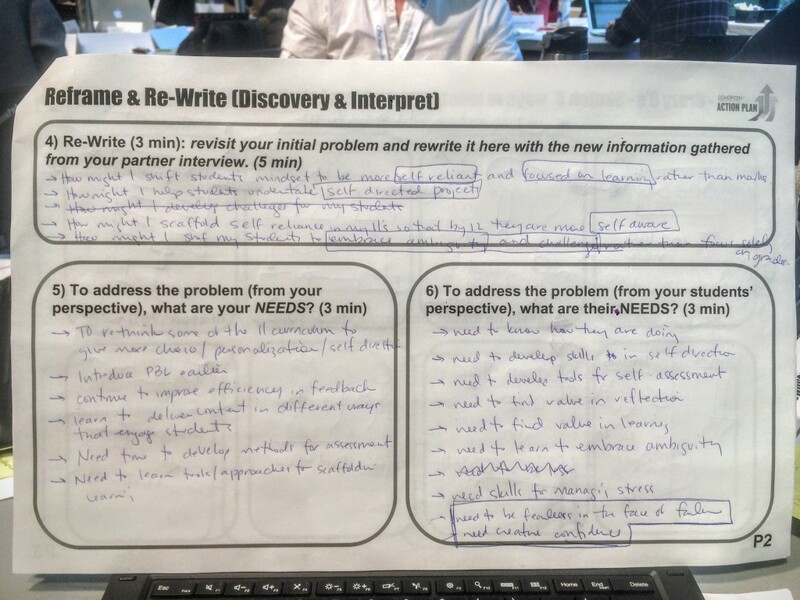 I pitched the 20 Time Project to them, using the same Design Thinking protocols that we used today at Cohort 21 (today’s workshop was adopted from Stanford’s d.School K-12 Lab. Here’s the original activity that we adapted for today, and here is the adapted version that we used today). Since the content in that course actually focuses on learning skills, what better class than to have this discussion right? And why wouldn’t they want to design their own project on something they are passionate about whether it be building a bicycle or learning to code, or starting a cooking blog? Well, as it turns out, I don’t know my user very well. The first response from the majority of students was one of feeling lost. They struggled to generate ideas for their project, they didn’t know how to plan ahead, they didn’t want to think for themselves, and they were mostly concerned about was how they were going to get a good grade on a project when I wouldn’t tell them what they needed to produce. So, I brought this dilemma to my subject team. I’m in my second year as Subject Team Leader for Social Sciences at Greenwood, and thus far I have disappointed myself in the lack of big thinking that I’ve been able to facilitate within my department. 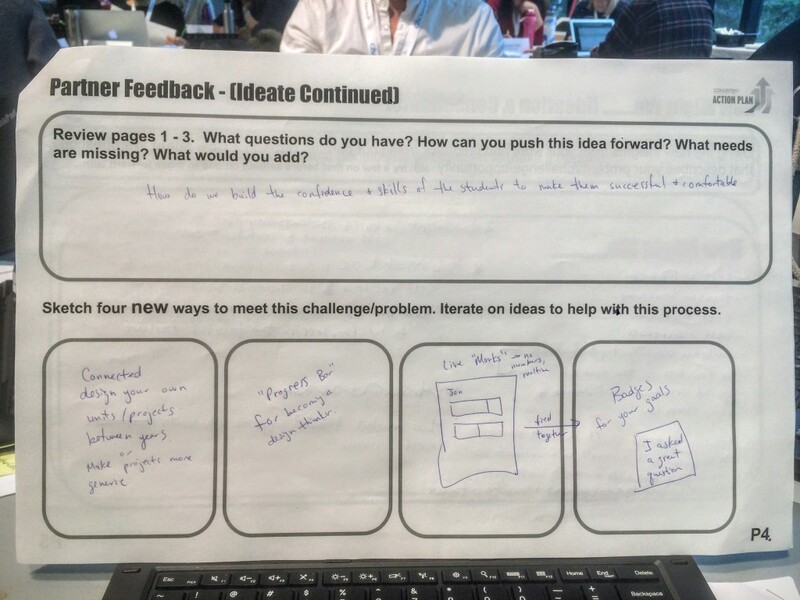 This question about students wants and needs inspired me to do a little Design Thinking with my department about our goals for increasing relevancy in our courses. In prepping for the meeting, I came across an activity called the Card Sort on DesignKit.org, and thought this might be one way to get to the heart of our problem. After a great brainstorming session we decided we would go back to our students and ask them for feedback on pedagogical approaches using a Card Sort. Here are the cards that I made for students to rank based on various criteria. Meanwhile, my grade 11 students, who are particularly motivated and diligent, begrudgingly obliged and went along with my unorthodox plan for their learning using the 20 Time Project. They came up with ideas, produced “elevator pitches” and have started some great projects. They were finally seeing the light that they need to be self-directed in their learning, right? Last week in class, I decided to introduce the Card Sort to my students with a guided reading of an article about and education documentary called Most Likely to Succeed. 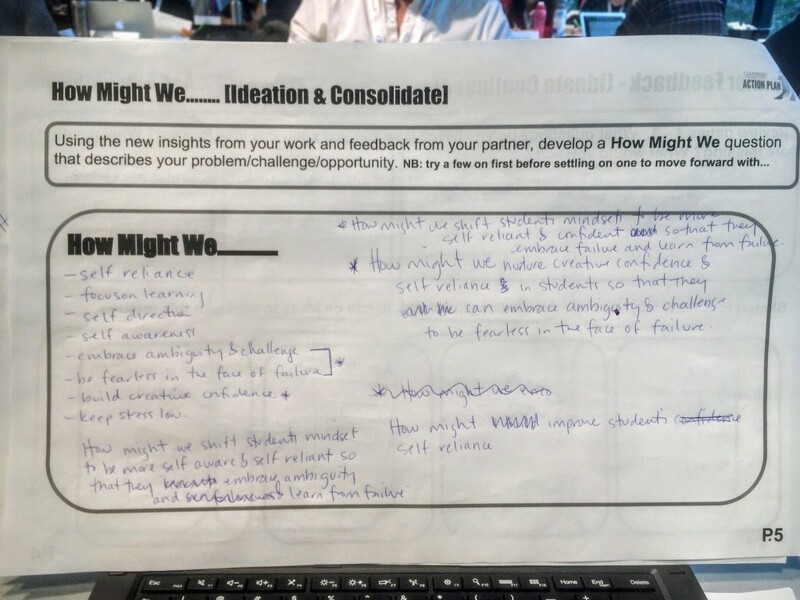 The film, produced by Ted Dintersmith and Tony Wagner, focuses on the need to shift our education model away from the teachers as content providers and students as information consumers, towards an integrated, project-based, problem solving, divergent thinking model à la High Tech High. I was hoping that students respond with “You’re right, Ms. McBeth! We totally need more experiences like this in school!” Instead, I was met with a firestorm of resistance. We spent the entire class debating learning vs. grades, and didn’t even finish reading the article, let alone get to the Card Sort activity. The students made some valid points in their arguments – content is important and feedback is critical – but overall, I was surprised by their rigid definition of learning and lack of understanding about what skills they would need to be successful in the future. When I asked them about what life skills they thought they would need, their replies included very practical ideas such as “knowing how to do my taxes” and completely omitted soft skills such as collaboration, problem solving, adaptability, curiosity (even though we had already done several lessons on Tony Wagner’s 21st Century Skills). I started off thinking about learning vs. grades and nurturing student confidence and self awareness in order to build self reliance. I made comparisons between my high end users and lower level users, and realized that what I was really getting at was personalizing self-direction based on readiness. 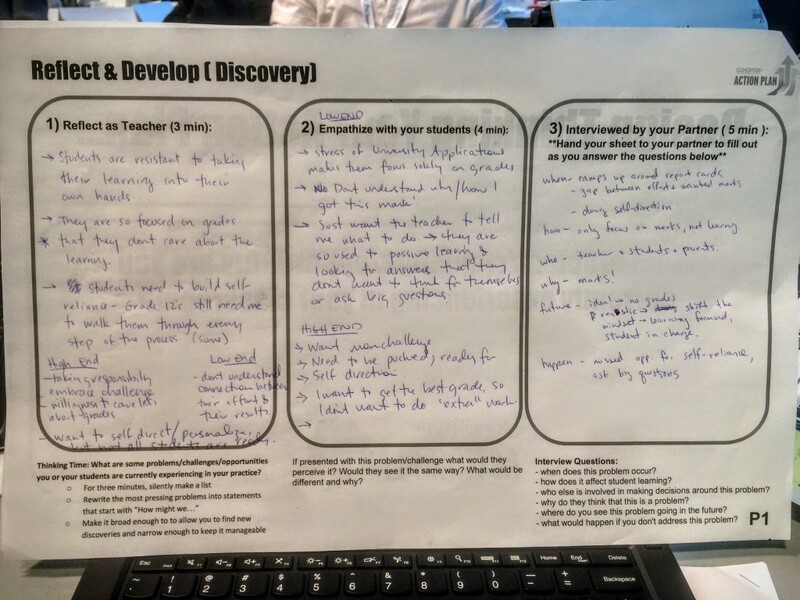 A few ideas came to mind, most of which are iterations on things I am already doing in the classroom, such as design thinking activities, asking big questions, personalizing based on readiness and interest, etc. 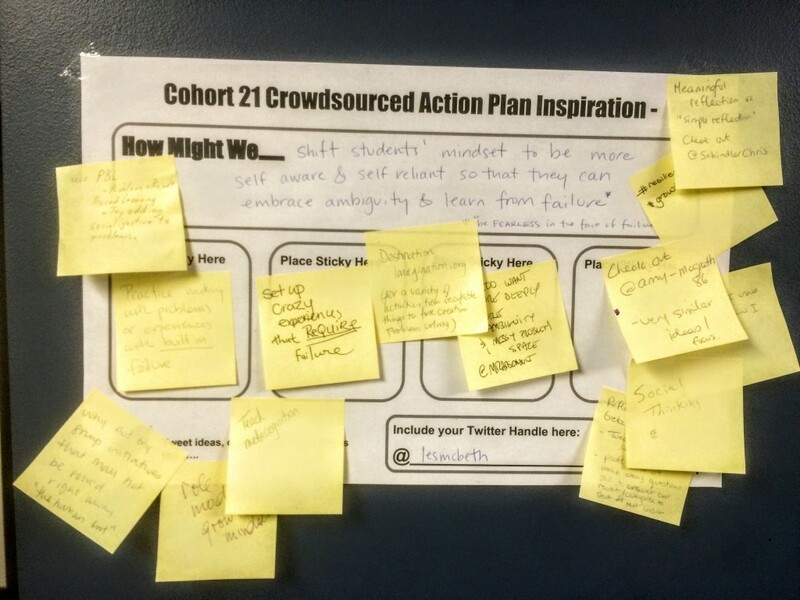 However, I realized that I need to get more student feedback on these activities and scaffold these activities more carefully to build student confidence. My partner, @dcheeseman, had some valuable feedback for me. In particular, I like his idea for a type of progress bar for student, which reminded me of @ehitchcock’s Action Plan. I rewrote and reworked my How Might We statement further based on my initial ideas and feedback. The same key words seemed to be prevalent: self-reliance, -direction and -awareness; confidence; value of failure; shifting mindsets. My final How Might We statement with plenty of thoughtful feedback from my Cohort 21 colleagues. Thank you! From here I am going to take my own advice and empathize, empathize, empathize! I will continue working with my Grade 11’s to dig deeper into their mindset and current opinions on what they value in their education. I’m going to start the empathize process with the Card Sort activity and then iterate more on my ideas based on their feedback. 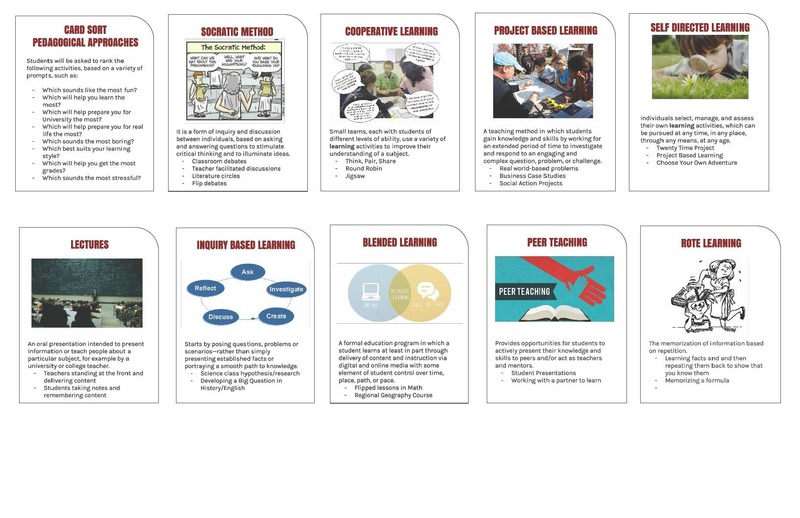 I’d also love some feedback from you on the activities that I have included in the Card Sort – does anyone have any approaches to add, or revise? I also look forward to hearing about other’s who are working on similar topics (@marsenault and @amcgrath). Thank you to everyone (especially @dcheeseman) for being so generous with your ideas, open to conversation and willing to put yourself out there today. As @hadams pointed out in her first blog post, vulnerability is the first step in learning! I think it is really interesting that we have similar goals but are teaching in different areas (I teach Grade Three). I find the constant feeling of needing to “prepare” students for the next thing…middle school, high school, university, is an awkward objective that does our students a disservice. I think that a significant shift needs to occur to get kids and their parents to see that being critical thinkers who can approach any problem is far more advantageous then a straight regurgitation of material to get to the next step. It is only initially that these “risks” feel risky, the depth of understanding that my “risk takers” are able to demonstrate is well beyond those who aim for the right answer. I would also argue that the report card of these students tend to be stronger as well, as they ask good questions to deepen their own understanding. @mjolicoeur Thanks for the thoughtful reply. It’s great to hear from your perspective as a grade 3 teacher and to know that this problem exists throughout their education, and not just in my senior students who are anxious about University acceptances. Your point about how the “risk takers” tend to also have the best results because they have a deeper understanding. Reading this made me realize that we also need to re-frame student’s perception of AFL assessments, as they provide the perfect opportunity for our students to take risks. Currently, they often see these assignments as “not counting” towards their mark, but if they could see them instead as an opportunity to fail and learn from it, or play and experiment with ideas, it might help with their confidence to take risks. Thanks for the insight! I look forward to hearing more about your experience in a grade 3 classroom! As I just wrote in @andrewmcniven ‘s post, Dr. Yong Zhoa’s book “World Class Learners” http://zhaolearning.com/ he writes about the importance of this shift, and how getting students ready for middle, high school and post-secondary isn’t what our motivation should be. @melissajolicoeur is right on the money in her comment. @gnichols, thanks for the tip about Zhoa’s book. I recall some of his ideas from when we went to see him speak at Hillfield Strathallan a couple years ago, but I have not read his book yet. I will check it out!